After being introduced in Justice League, Aquaman/Arthur Curry (Jason Momoa) gets his own film. Hopefully it’s more Wonder Woman and less Man of Steel. 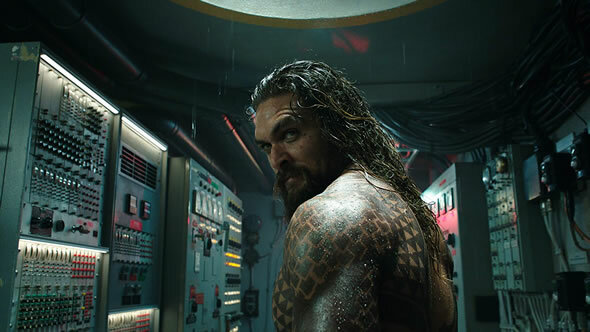 The trailer gives us his origins—son of Thomas Curry, a human, and Queen Atlanna (Nicole Kidman)—and the central plot—a struggle for power between Aquaman and his half-brother, Patrick Wilson’s Orm. At the center of this battle is a trident that also interests the villain Black Manta (Yahya Abdul-Mateen II). Mera (Amber Heard) serves as Aquaman’s guide to the seven kingdoms of Atlantis. Aquaman, directed by James Wan (Furious 7), arrives in theaters December 21st. Godzilla: King of the Monsters arrives in theaters on May 31, 2019, five years after Gareth Edwards’ Godzilla hit the big screen. During that time Edwards went on to direct Rogue One: A Star Wars Story, and Krampus director Michael Dougherty was brought on to tackle this sequel. Godzilla saved the world in the first film, and he’s back to do it again, facing off against Mothra, Rodan, and the three-headed King Ghidorah. The humans at the center of the story include Millie Bobby Brown’s Madison Russell, her mother Dr. Emma Russell (Vera Farmiga) and her father Mark (Kyle Chandler). Ken Watanabe and Sally Hawkins return from the previous film, and O’Shea Jackson Jr, Thomas Middleditch, Zhang Ziyi, and Charles Dance join the monster-mash this time around. Jonah Hill’s feature directorial debut follows Stevie (Sunny Suljic, The Killing of a Sacred Deer), a 13-year old in Los Angeles, who finds relief from a difficult home life by skateboarding with his new friends. Mid90s also stars Katherine Waterston as Stevie’s mom, and Lucas Hedges as his brother. Look for it in select theaters beginning October 19th. The end of M. Night Shyamalan’s Split revealed that it took place in the same universe as his 2000 film Unbreakable. Now, 19 years after that film, comes a sequel to the story of David Dunn (Bruce Willis) and Elijah Price (Samuel L. Jackson), aka Mr. Glass. Bringing the men back together is James McAvoy’s Kevin Wendell Crumb, aka The Beast. Sarah Paulson plays Dr. Ellie Staple, a superhero denier, and Anya Taylor-Joy returns as Casey Cooke from Split. Glass hits theaters on January 18, 2019. The April 5, 2019 release Shazam! (which is not a remake of the 1990s movie that never existed) will show the lighter side of DC Comics. Directed by David F. Sandberg (Lights Out, Annabelle Creation), the film follows Billy Batson (Asher Angel) as he’s granted superpowers by an ancient wizard (Djimon Hounsou) and with one word—Shazam!— can turn himself into an adult superhero (Zachary Levi). Aided by his friend Freddy Freeman (Jack Dylan Grazer), Billy must learn about his powers and face off against Dr. Thaddeus Sivana (Mark Strong). The second film in a planned five-film series, the November 16 release Fantastic Beasts: The Crimes of Grindelwald continues the story begun in 2016’s Fantastic Beasts and Where to Find Them. The villain of the series—Johnny Depp’s Grindelwald—revealed himself at the end of that film. Now, at the behest of his mentor Albus Dumbledore (Jude Law), Newt Scamander (Eddie Redmayne) will face off against the Dark wizard. David Yates returns to direct his sixth film in J.K. Rowling’s wizarding world, and Katherine Waterston, Dan Fogler, Carmen Ejogo, Ezra Miller, and Alison Sudol are back as well. Joining the cast are Zoe Kravitz (who was introduced via a photo in the first film), Jessica Williams, Claudia Kim, Poppy Corby-Tuech, and Callum Turner. After almost a decade in development, James Cameron’s adaptation of the popular Battle Angel Alita manga series was finally handed off to Robert Rodriguez (Machete) to direct. (Cameron’s a little busy with Avatar.). Set far in the future, the story centers on Alita (Rosa Salazar), a cyborg found in the scrapyard of Iron City by Dr. Ido (Christoph Waltz). With no memory or recognition of the world, Alita must learn to navigate the dangerous Iron City and find the truth behind her origin. With a supporting cast of Keean Johnson, Eiza Gonzalez, Mahershala Ali, Ed Skrein, Michelle Rodriguez, Casper Van Dien, Lana Condor, Jackie Earle Haley, and Jennifer Connelly, Alita: Battle Angel hits theaters on December 21st. What They Had is the debut feature of writer-director Elizabeth Chomko. The October 12 release stars Hilary Swank and Michael Shannon as siblings dealing with their mother’s dementia. Blythe Danner plays their Alzheimer-afflicted mother, and Robert Forster is their stubborn father. The filmed earned good reviews when it premiered at Sundance earlier this year. Mike Leigh’s long-awaited follow-up to 2014’s Mr. Turner dramatizes the Peterloo Massacre of 1819. The bloody incident occurred in St. Peter’s Field in Manchester England when local magistrates set sabre-armed cavalry on a crowd of 80,000 people who were gathered to demand parliamentary reform. Coming to select theaters November 9th, Peterloo stars Rory Kinnear and Maxine Peake. Here’s a four-minute look at Christopher Robin, starring Ewan McGregor as the titular character. All grown up with a job and a family, Christopher encounters his childhood friend Winnie-the-Pooh and rediscovers the joys of life and the value of friendship. Directed by Marc Forester (Finding Neverland, World War Z), the August 3 release stars Hayley Atwell and features the voices of Jim Cummings, Chris O’Dowd, Brad Garrett, and Toby Jones. Cut Throat City is the story of four friends who return to New Orleans’ Lower Ninth Ward after Katrina to find there’s nothing left. They believe their only option is a life of crime. The 2019 film is directed by Wu-Tang Clan’s RZA (Love Beats Rhymes, The Man with the Iron Fists) and stars Shameik Moore, Wesley Snipes, T.I., Terrence Howard, Demetrius Shipp Jr., Denzel Whitaker, Keean Johnson, Tyron Woodley, and Kat Graham. Gerard Butler, Gary Oldman, Common, Linda Cardellini, and Toby Stephens star in this October 26 release based on novel Firing Point by Don Keith and George Wallace. Directed by Donovan Marsh, Hunter Killer tells the story of American submarine Captain Joe Glass (Butler) who must thwart a Russian coup and prevent World War III by rescuing the Russian president. Things have certainly changed since the book was published in 2012. After making the jump to directing with Meadowland in 2015, cinematographer Reed Marano went on to direct the first three episodes of The Handmaid’s Tale before coming to the 2018 Sundance Film Festival with this post-apocalyptic tale of a loner (Peter Dinklage) whose solitude is disrupted by a young woman played by Elle Fanning. Despite mixed reviews, I Think Were Alone Now won a Special Jury Prize for Excellence in Filmmaking. Find it in select theaters beginning September 14th. Operation Finale tells the true story of Mossad agent Peter Malkin’s 1960 mission to infiltrate Argentina and captures Adolf Eichmann, the Nazi officer behind the transportation of millions of Jews to their deaths in concentration camps. Directed by Chris Weitz (A Better Life), the August 29 release stars Oscar Isaac, Ben Kingsley, Melanie Laurent, Nick Kroll, Joe Alwyn, Haley Lu Richardson, Greta Scacchi and Lior Raz. Julien Faraut’s documentary John McEnroe: In the Realm of Perfection, narrated by Mathieu Amalric, has received excellent early reviews. Look for it in select theaters beginning August 22nd. Erik Matti’s BuyBust follows anti-narcotics special operative Nina Manigan (Anne Curtis) as she tries to survive a brutal gang and bloodthirsty citizens after a drug bust goes bad. Early reviews have been good for this August 10 release. Coming to digital on August 28th and theaters September 29th, The Padre follows a retired U.S. Judge (Nick Nolte) and his hired gun (Luis Guzmán) as they track down a con man (Tim Roth) in a small Colombian town. To All the Boys I’ve Loved Before is an adaptation of Jenny Han’s best-selling YA novel. Lana Condor stars as Lara Jean Song Covey, whose imaginary life becomes very real when her secret love letters fall into the hands of the five boys she’s had a crush on. Susan Johnson (Carrie Pilby) directs this August 17 Netflix release from a script by Sofia Alvarez. Coming to On Demand and select theaters August 24th, Blue Iguana follows American ex-cons Eddie and Paul as they get involved with English lawyer Katherine Rookwood (Phoebe Fox) and the heist of a blue diamond. Love, Gilda, director Lisa D’Apolito’s documentary portrait of comedian Gilda Radner comes to select theaters beginning September 21st. Kevin Kerslake’s Bad Reputation chronicles the life of Joan Jett. Find it in select theaters and on Amazon Prime video and On Demand beginning September 28th. Yorgos Lanthimos’ The Favourite will open the New York Film Festival on September 28. The 2018 Toronto International Film Festival will take place from September 6th to 16th, and it has another strong lineup.